I hope that all of you experienced a safe and festive 4th of July. I had a bit of time to sew this weekend and have been wanting to try a pattern I have seen on two blogs, Cottage Cozy and Sweet Cottage Dreams. Carrie and Becky both made beautiful blouses and since I don't usually make clothing, I thought I would give it a try. I didn't want to use any "good" fabric since it's expensive and I didn't know if I would be able to figure it out so I search around in my pile of goodies and found two vintage tablecloths that had bad stains in places and had been purchased to make into something else. I used the floral cotton cloth for the front and back and used a linen, crochet trimmed cloth for the sleeves. I really like the way it came out and as my post title states, something old became something new. I did learn a couple of things that I want to share. First of all, pattern sizing is not like purchased clothing items. 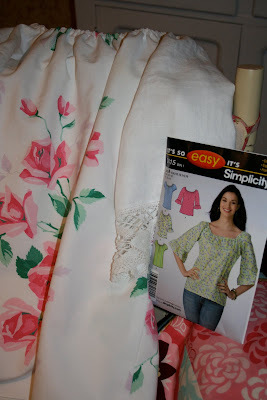 I normally wear a size 10-12 top and needed to use the size 16 pattern for the blouse. It's important to take your measurements. I know we all get hung up on numbers (I'm one of the worst) but we are what we are, beautiful any size, and it would be so frustrating to finish it only to find out that you couldn't get it over your head. Also, the grain of the fabric is important. There is not a whole lot of stretch with a cotton tablecloth, but the little there is should have been placed in the opposite direction for sure. You want it to bend and stretch where you do. For a test sample, I'm quite pleased and plan on wearing it. I ventured outside to see how the garden stood up to the intense heat on the 4th and caught a shot of this dragonfly. Honestly, it hung around so long that I thought it was posing! I couldn't resist sharing this fantastic lily with you. I love it's ruffled edges and intense center color. It seems to me like it's sporting a fancy ball gown. I hope this day finds you thankful and rested from the weekend. it turned out super pretty my dear!! i cant wait to get my own sewing machine! 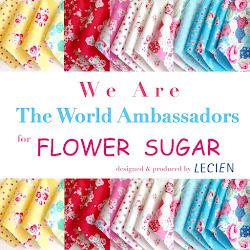 Thank you so much for stopping by my blog and becoming a follower! I know Becky, too and have seen her beautiful vintage blouses she's made. I was inspired, but alas, didn't do much more than just dream about it. I recognized the pattern of your vintage tablecloth! I don't know the name, but the maker is Wilendur. I love it! Your blouse is beauitful! GREAT JOB! Wow! I love it! It looks great with that fabric. So creative. And your lily! I have not seen one with ruffled edges. What a beautiful touch! Love the blouse it turned out beautiful!! Wow! I LOVE that top! I want one, now! :) I don't have too many extra vintage linens, so now I have another reason to look for it. Great job! Beautiful....everything is beautiful. You did a great job! I need to get in the sewing mood! The top is just adorable. I like the lacy sleeves. The dragonfly was so nice to sit still just for your photo op. I should have told you ahead of time, Renee. I had to do the exact same thing with the sizing....incredible uh? Your blouse turned out wonderfully...I just love it! The tablecloth for fabric? genius! I love this and I have that tablecloth! I actually took it out considering cutting it up for a project and just couldn't bring myself to do it. lol. I don't know what is up with the pattern sizing, I just purchased a pattern for a simple skirt for my daughter. She is a size 10 and I had to make a size 18. How can their sizes be so far off? 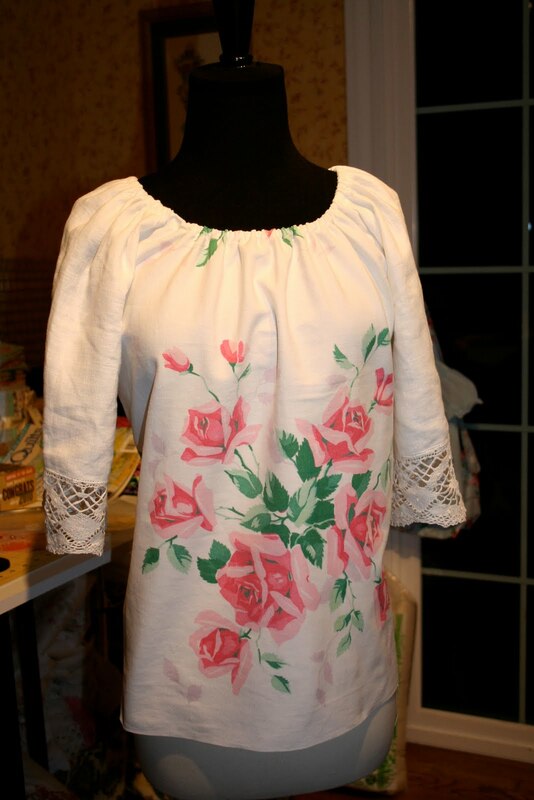 Wonderful top, great use of old pretty table cloths.